Eagles executive vice president Howie Roseman (left) and center Jason Kelce. If you love the Eagles, let me get a "Hell, yeah." If you love the Philadelphia Eagles, let me get a "Hell, yeah!" I'm going to take a second to talk to you about underdogs. I know I just talked about this at the combine, but I don't think it's been beaten home enough. A few years ago, I relinquished pretty much all control in this organization. I was sent to the other side of the building, where no one saw me for over a year. Well, except for Jeffrey, when he would slip into my closet-size office and vent about how Chip had traded Shady or was being mean to the players or refused to show up at the holiday party. Then, two years ago, Jeffrey made a decision, and I came out of there a different man, with a purpose and a drive to make this Super Bowl possible. You saw a different Howie Roseman. Well, not really. I had to make sure we were under the cap then, and I have to make sure we're under the cap now, which means these guys are my underdogs. Jason Peters was told he was too old, didn't have it anymore. Before he got hurt, he was the best freaking tackle in the NFL. We still think he is. Even at 36. Even with a $10.7 million cap hit this year. Big V was told he didn't have it. He's still on his rookie contract. J.P. might get hurt again. Big V: big-time underdog. 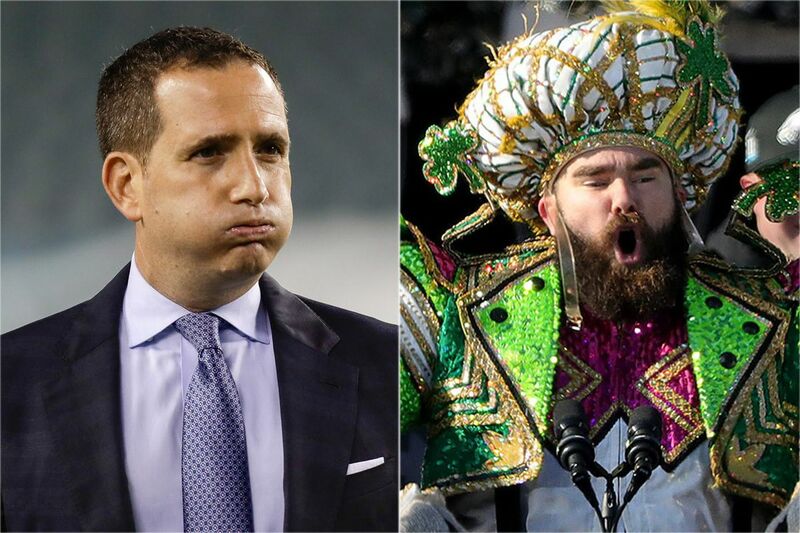 All indications are that Eagles vice president Howie Roseman (center) still considers tackle Jason Peters (right) part of the team’s immediate future. Jason Kelce is too small. Kelce just had the best season of his career, and he looks damn fine in purple and green. But he needs to keep up the fine play and awesome speech-making. His cap number stays around $7 million from 2018 through 2020. Now, here's the tough part of my job. There are underdogs, and unfortunately, there are going to be overdogs, too. Fact of life in the NFL. Nick Foles don't got it. Thank goodness, he had it for us. Now, we have to ask ourselves, will we need him to have it for us in 2018? Suppose Carson Wentz gets hurt again. Suppose we can trade Nick for a first-round pick. Check back with me in July. Torrey Smith can't catch. Look, I love Torrey. Great person. Smart. Love what he brought to the locker room. But that thing about not him catching the ball, that was kind of true until the playoffs started. We wish him well with the Panthers. Brent Celek's too old. I'm not sure he is. Brent definitely doesn't think he is. But if he wants to play here, it has to be at our price. Darren Sproles is too small and too old. The first part was never true. The second part? We've got Corey Clement now, and he's definitely an underdog. Vinny Curry ain't got it. I'm not saying he ain't got it. I am saying, though, that Michael Bennett is an excellent player and is more … shall we say … cost-effective next season. Draw your own conclusion. Beau Allen can't fit the scheme. He can probably fit someone else's scheme better. Nigel Bradham can't catch. He can catch running backs and quarterbacks and every back in between. We want him back. If we can make that happen, we will. It'll be tough, though. Patrick Robinson can't cover. He never covered better than he did last season. Is he really going to be that good again, though? And remember, we have Sidney Jones and Rasul Douglas. Trey Burton's a nobody. Not anymore. He's going to get paid, and we wish him well. Hashtag "Philly Special" Forever, Trey! This team was a bunch of driven men who accomplished something. For one great season, we were a bunch of underdogs. But we can't be exactly the same bunch of underdogs again next season. We want to keep everyone: all the players, all the coaches. Bottom line is, we can't, and that's why I'm up here today. No one wants this. No one likes this. No executive likes to change a team that won the Super Bowl, and certainly none of our fans likes it. But you know what? I just heard one of the best insights the other day, and it's new, and I hope you learn it because I'm about to drop it right now. You know what I have to say to all those people who doubt us, all those people who are counting us out, and everybody who is saying we can't get it done again?